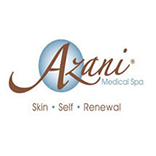 Azani Medical Spa in Bethlehem, PA is a full service medical spa serving the surrounding areas of Nazareth, Orefield, Center Valley, Cooperstown, Doylestown, East Strasburg, and beyond. Azani offers premium dermal fillers, laser vein removal, laser hair removal, chemical peels for acne, HCG medical weight loss, skin rejuvenation, and other medical aesthetic spa treatments. Azani aids their philosophy of creating long-term relationships with patients by giving complimentary skin analyses to visitors. In conjunction with a treatment plan customized to their skin, patients can look forward to a beautifully glowing complexion. Medical director Dr. Monica Carezani-Gavin has guided Azani Medical Spa towards achieving excellent results with clients for over ten years. As an experienced acne specialist and Diplomate of the American Academy of Anti-Aging Medicine, she believes in treating all skin condition with only the most effective, safest treatments. Dr. Gavin and the rest of Azani's highly trained staff have been recognized by media outlets like CBS Philadelphia News, Channel 69, and Eastern PA Business Journal for their expertise in skincare. Azani’s wide selection of treatment options including IPL Photofacial, laser hair removal, Botox & Dysport, and laser skin rejuvenation draws in clients from surrounding areas. Clients typically come to Azani seeking relief from acne, large pores, cellulite removal, and rosacea. A complimentary skin evaluation at Azani will help you determine which treatment will work for you. In addition to improving your outward appearance, the Azani medical team will help you maintain a healthy glow by teach healthy skin habits, giving nutritional advice, and by evaluating your lifestyle to come up with skin care routine designed specifically for you. Contact us today for more details on any of the services offered or to speak with a skin care specialist at Azani Medical Spa in Bethlehem, near Allentown and Easton.